Click on this picture to see Troy's story. Activist Troy Amlee, a Lakota whose native name is White Horse Warrior, responded to a request from Occupy Homes MN to meet with an Anishinabe woman, Anita Reyes-LeRey, whose south Minneapolis home had been foreclosed upon by Woodlands National Bank, even though she thought she had a deal to rent the home and then acquire a new mortgage two years later. Reyes-LeRey was four minutes late in calling the bank to finalize the agreement, and the deal was cancelled. Amlee is a member of the American Indian Movement (AIM). 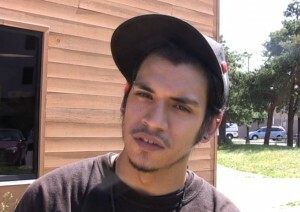 AIM was involved last year with the Occupy movement, but had ceased until he skateboarded to Reyes-LeRey’s home. “So now I’m thinking that this could mend the threads that have been broken so to speak,” he said. Real Indians Protest Racist Name Used By Fake Ones: Fighting "The R Word"
Story for The UpTake by Sheila Regan/Video by Todd Billings&Bill Sorem Celebrities, sports stars, politicians and civil rights leaders joined hundreds of American Indian protesters and their allies Thursday night as they stormed the Hubert H. Humphrey Metrodome in Minneapolis to protest against the Washington D.C. football team whose team name they say is racist and offensive. Among the all-star cast of supporters of the protest, which was organized by the American Indian Movement (AIM), were former Minnesota Gov. Jesse Ventura, Olympic Gold Medalist Billy Mills (a Lakota Sioux from Pine Ridge, S.D. ), St. Native American activist groups in Minnesota would like people to learn the real history of Christopher Columbus and quit putting him up on a pedestal at the State Capitol. At 5:00 a.m. on Election Day, 40 Hennepin County Sheriff's Deputies arrived at Mayoral Candidate Jaymie Kelly's house in Minneapolis to evict her, smashing doors and breaking windows.